The Catalan government is determined to reopen its offices abroad that were closed during the recent period of direct rule from Madrid, after article 155 was applied. This, despite the new Spanish executive launching a high court challenge against Catalonia’s decision on Thursday evening. The Catalan foreign ministry said that the calendar to reopen and expand the network of offices all around the world stays as planned. 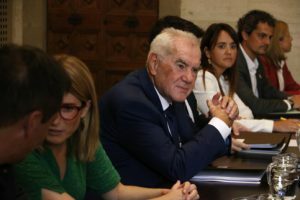 The head of this department, Ernest Maragall, asked if ‘that is an evidence of dialogue’. ‘Has the Spanish ministry no other job to spend time and resources to launch stupid formal battles? It’s a typical show of absurd and useless evidence of pride,’ he said via Twitter on Thursday evening. According to him, ‘it is the interest of the Catalan government that Catalonia is present in the world’. The Spanish executive justifies the appeal in Catalonia’s high court on the basis that the government has not followed the administrative procedures required by law. The Spanish law says that regions must formally communicate their intention to open representative offices and receive authorisation from Madrid. Yet Catalonia’s officials claim they did inform Spain’s foreign ministry by letter and in a meeting on 23 July. Following the closure of all the delegations abroad but one, the Catalan government reopened six of them, including in Switzerland, Germany, the UK, Italy, France and the USA. Others are expected to be relaunched in the near future, including Portugal, Scandinavia or the Balkans. Maragall said in June that ‘within six months’, other offices are expected to be working in other regions such as the Magreb and Asia. Thus by the end of the year, the Catalan government will have more delegations abroad than when Spain shut them all but one down last October. He also stated that closing the delegations had cost 485,000 euros.